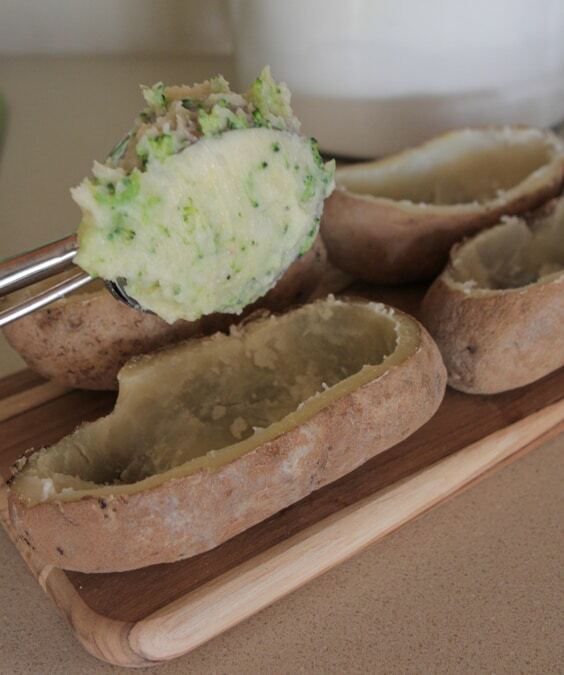 Baked potatoes just got better with my Loaded Broccoli & Cheese Twice Baked Potato! 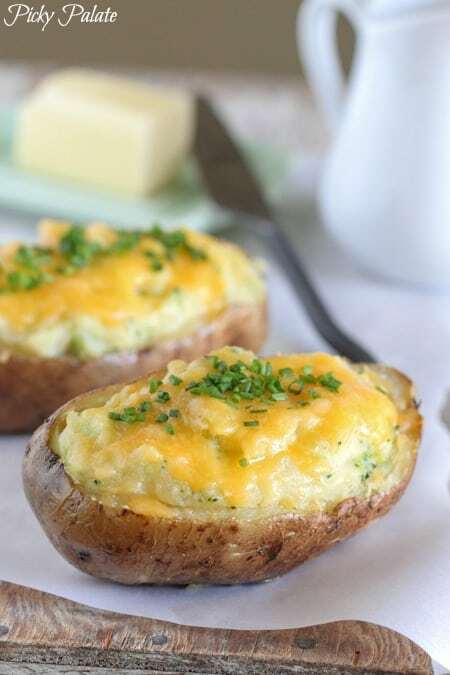 How good are twice baked potatoes?! I haven’t had one in years but had a craving to create my own this week after reading the latest Food Network Magazine. So glad I did, what a treat they were. I made a homemade broccoli and cheese sauce that gets mixed into the mashed potatoes before baking again. Seriously I died. Kick your diet to the curb for a day and indulge in these babies! Let’s take a look at how to make em’! 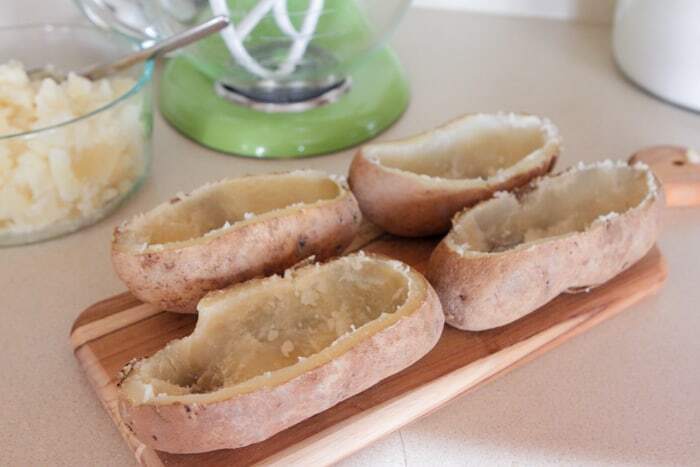 Bake 4 large potatoes at 375 degrees F. until fork tender. Cut off about 1/2 inch from the tops. 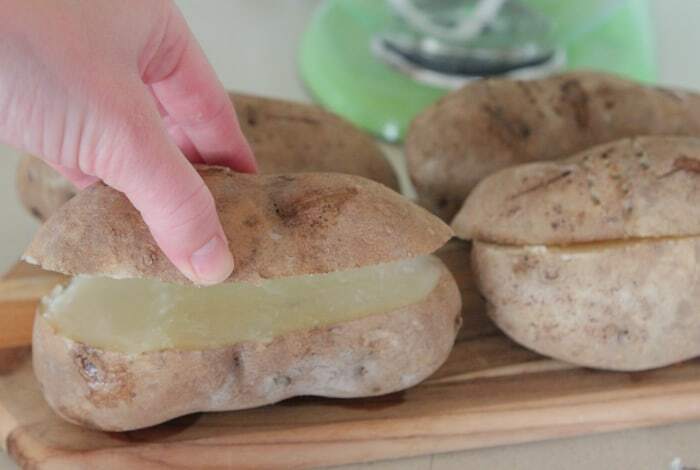 Take a knife and cut around the border of the potato leaving about 1/2 inch edge. 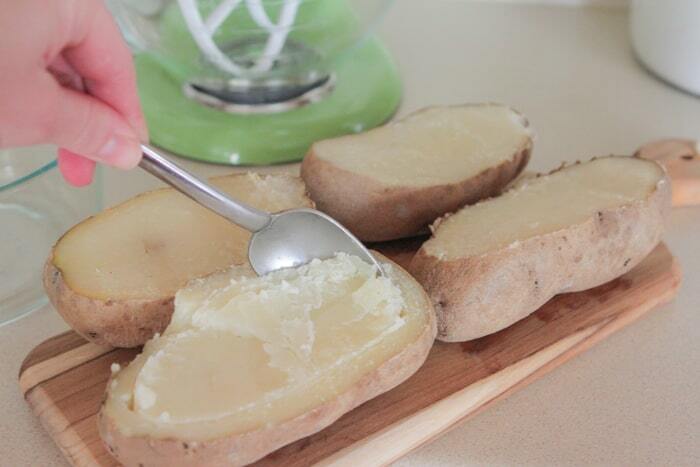 Spoon out the centers and place into a bowl. Time to get started on the mashed potatoes that will go back into the baked potato shells. A little butter, salt, pepper, garlic salt and milk. Simple. 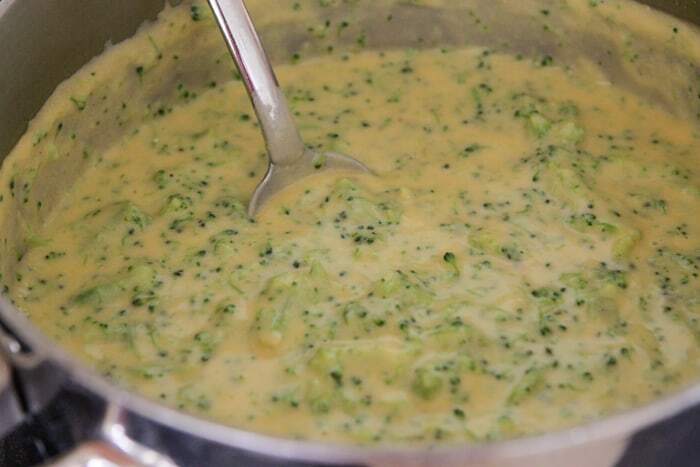 For the love of this broccoli cheese sauce. No words…other than use the leftovers as a soup! 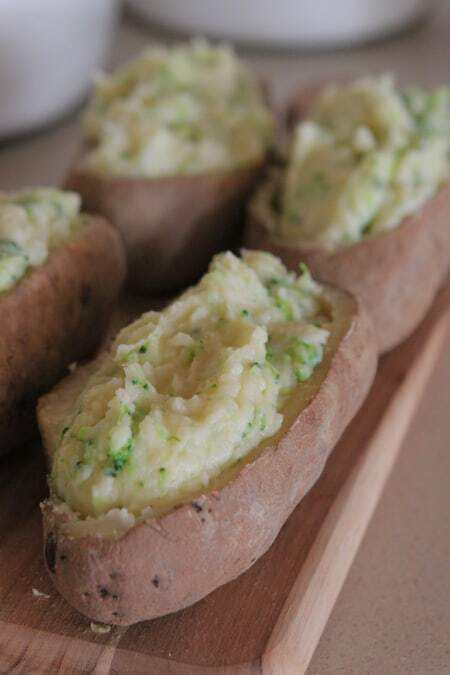 I added 1 cup of the broccoli cheese sauce to the mashed potatoes then scooped it all back to the baked potato shells. 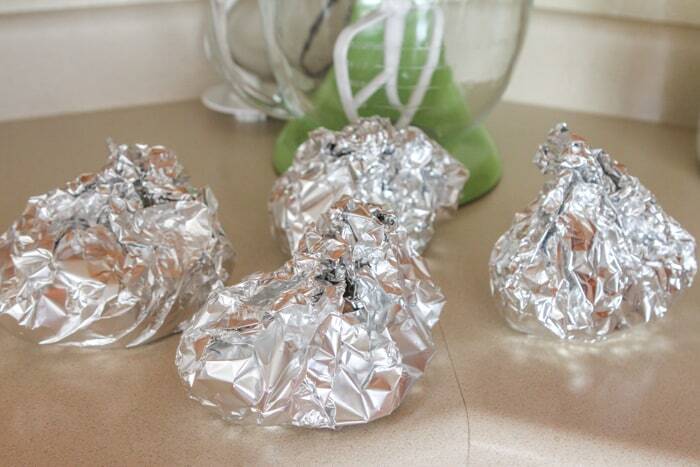 Preheat oven to 375 degrees F. Pierce potatoes a couple times with a fork and wrap loosely in foil. Bake for 1 hour or until fork tender. Remove and cut off top 1/2 inch across tops. With a knife, cut around borders of potato leaving about 1/4 inch around edges. Spoon out centers and place into a bowl. 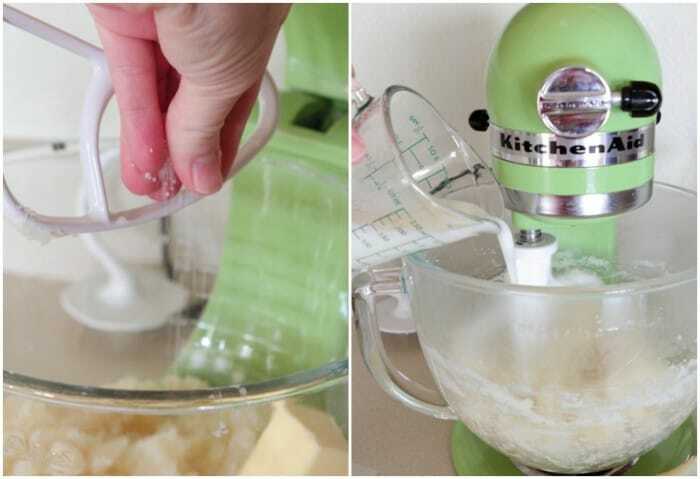 Transfer to a mixer and add butter, salt, pepper, garlic salt and milk. Beat on low until well combined. 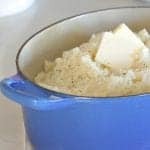 To prepare sauce, melt butter into a medium saucepan over medium heat. Whisk in flour, salt and pepper. Slowly whisk in broth, continuously stirring until thickened. Add cheese and sour cream, stirring to combine. Steam broccoli florets until fork tender, drain then cut into small pieces. Add to cheese sauce. 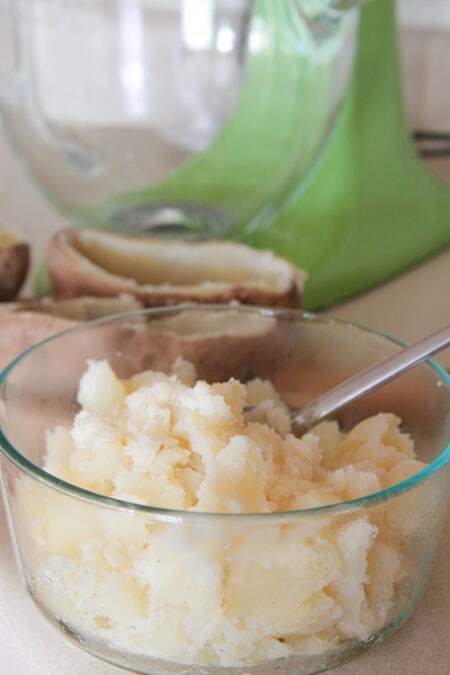 Add one cup of cheese sauce to mashed potatoes, mixing to combine then fill potato shells with mashed potatoes. Top with additional shredded cheese and bake for about 20 minutes or until cheese is melted. Garnish with chopped chives if desired. Serve warm. I LOVE these! I have always just had bacon bits and cheese in my twice baked taters. loving that you added some veggies..and color! I love broccoli and cheese potatoes! Yum! Oh my goodness — SERIOUSLY craving these now at 9am! 🙂 They really look awesome Jenny! oh my!! Seriously these look insanely delicious!! What an awesome recipe! Love broccoli and cheese together! Ahh this is like the best of both worlds!! Jenny- these are honestly like my favorite thing ever!! Love twice baked potatoes! Your are pure evil genius! 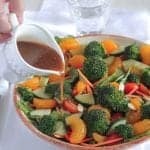 As soon as I take a break from my low carb I will be making these! Thank you!!! 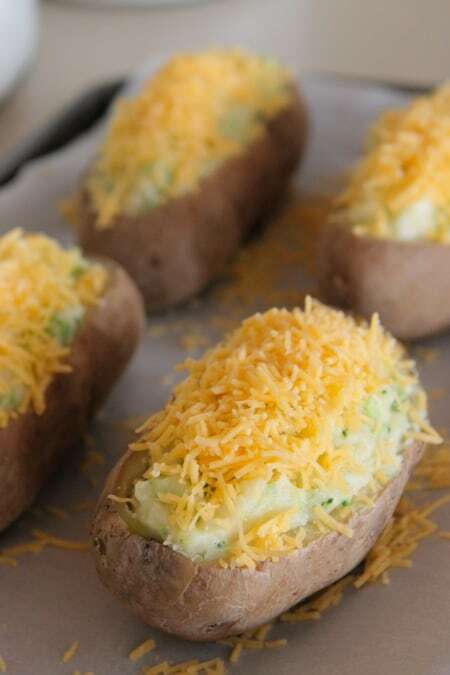 Twice baked potatoes freeze great just let them cool down and put them in the freezer before the second bake. I like to make extra since there are so much work and then you have a nice treat when you are in a rush. 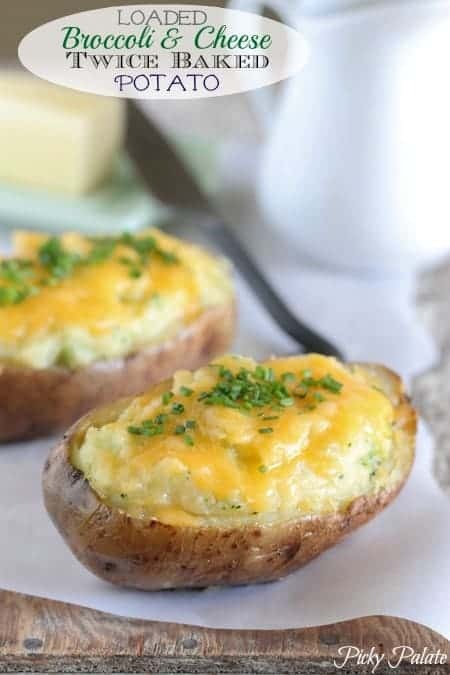 I don’t even like potatoes really, but these look fantastic!! Loooove! Oh wow, this looks so wonderful! I love twice baked potatoes! And you can never go wrong with broccoli and cheddar! This looks like an amazing treat! Just looking at the photo makes my mouth watery. Yeas, please. I don’t know why we never makes these at home. It states 1 cup of shredded cheese twice in the directions. Is this a misprint, or are there supposed to be 2 seperate cups? Why am I not living inside your mouth? Oh yum!! These look delicious!! I love baked potatoes! So filling and they’re still a veggie, right?! YUM! Just made these…delicious! And you are absolutely right, the sauce makes an excellent soup! Happy to have the leftovers. Do I need to do anything to the sauce to make it a soup or eat as is? Those look so good they are making me hungry, cant wait to make them. Hello! I pinned this a while ago and finally made it tonight. But the potatoes were not done after an hour and 20 minutes, is that normal? And when I scooped out the insides, it was so hard, it didn’t get creamy so the inside had chunks of potatoes, isn’t that right? I never had this problem with potatoes before so maybe I just need to go up in temp. I was just curious if they were supposed to be underdone like that. Thanks! !